Do you have a minute to spare to learn some English? Here comes Sam to tell us everything about nothing -no, not any and none, that is! Give us 60 seconds and we'll give you the English! 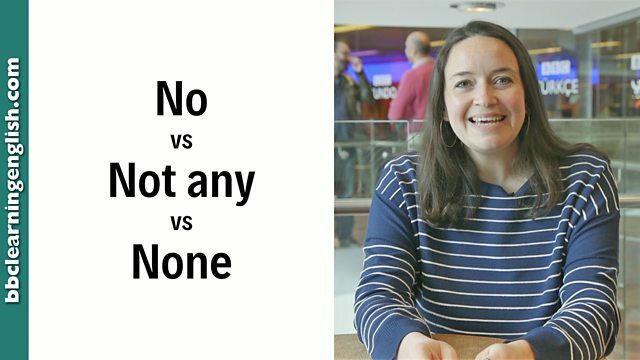 Hi, I’m Sam from BBC Learning English, and today we’re looking at the difference between no, not any and none. Let's have a look. Imagine you ask me this question: Do you have any change? Sorry, I have no change. – where we use the verb have with no followed by a noun. Sorry, I don’t have any change. – where we use the negative don’t followed by the verb followed by any followed by the noun. Or, I can say: Sorry, none at all – where we use none without a verb or a noun, so it's a short answer. So now you shouldn’t have any problems with this! We can use the negative don’t + the verb + any + the noun. Sorry, I don't have any change. He doesn't have any time to speak. We can use none without a verb or noun. It's a short answer. Does English like double negatives? Which of these is correct? It's a small word used in negatives and questions. It begins with a vowel! None can be used as a short answer, how?